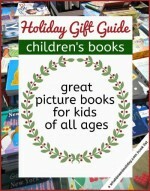 This is my third list of gift books for every child’s interest. 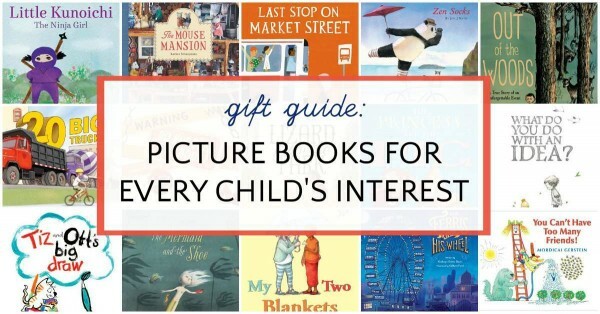 Today I’m sharing some of my favorite picture books that I recommend for gifts. If you need a different type of book, you can also find titles here: chapter books (middle grade) for every child and early chapter books for every child. Most of our picture book lists contain books that will make your kids laugh out loud. For more ideas follow this link to a list of funny books for kids. The Book with No Pictures. You’ve probably heard of this book by now, and if you haven’t please get yourself to the nearest book supplier and pick it up. Unless you are a very serious person. Serious people should stay far away from this book. Although come to think of it, perhaps this book is the perfect antidote for seriousness. Crankee Doodle. This book is hilarious, zany, goofy and completely ridiculous. In other words, we loved it. Riffing on the classic song, grouchy Yankee and his cheery horse have an absurd conversation about macaroni and hats and who-knows-what. It all ends in the inevitable trip to town, but not as you might expect. Super silly and super fun. If your kids are old enough for a lift-the-flap book without ripping all the flaps off, by all means present them with the awesome The Ultimate Book of Vehicles: From Around the World. Twenty Big Trucks in the Middle of the Street. This is a truck book, so of course it was a huge hit with my then-4 year old. This rhyming counting book starts out with a ice-cream truck that stalls in the middle of the street (every kid’s dream). But then the different trucks start to pile up behind it, causing a rather large and entertaining traffic jam. How will the traffic be dispersed? My son kept offering various solutions to that problem during our reading. It turns out, one of the trucks provides the solution and the the ice cream truck (of course) provides the dessert. Train. I love Elisha Cooper’s illustrations. They are so fun to pour over. This story follows different types of trains across the country on their journey. Cooper’s trademark attention to detail makes this book a real treat. I love how it opens up wide so the trains really stretch across the pages. A glossary and end note give more information for true train enthusiasts. Zen Socks. I plan on including this in my upcoming list of our favorite books of 2015, but I thought it had a place on this list, too. This is the latest in Jon J Muth’s Zen Shorts series, and like the others, Stillwater the Panda offers important lessons to his friends about the importance of kindness and empathy towards others. Gentle humor and “ah ha” moments keep things from getting preachy and of course, Muth’s illustrations are marvelous as usual. Grandfather Gandhi is an absolutely gorgeous book! The story is narrated by then-12 year old Gandhi’s grandson, Arun. Arun goes to live with his grandfather, which was considered a great honor. One day his grandfather gets angry, a surprise to Arun. Gandhi explains to his grandson that anger is a normal human emotion, that people must work to conquer and transform so that it can be used for a good purpose. This is a marvelous, must-read book that will encourage your kids to think about the role emotions play in the choices we make. You Can’t Have Too Many Friends! is one of the most bizarre stories I have read, but my son can’t stop referring to it and I admit I quite like an offbeat picture book myself. It’s a folktale-style story and lots of fun. A duck grows prize-winning jelly beans and the king borrows them, promising to return them. A year later, the duck has still not gotten his jelly beans back so he sets off to retrieve them. Along the way he meets a dog, a ladder, a babbling brook and hive of wasps who all want to travel with him. The duck shrinks the dog and the ladder and puts them in his pocket, the babbling brook travels in the duck’s gullet and the wasps in his ear. (I said it was weird.) At the castle, the king lounges in his bath while his mother uses turkeys, an oven, and a well to thwart the duck’s attempt to get his beans back. In a series of events too bizarrely hilarious to recount in a single paragraph review, the duck still fails to find his beans. However, all is not lost as the king makes a miraculous about face. That’s all I can say. The book is super weird, but we all really loved it. My Two Blankets follows a young African girl who travels as a war refugee to a new, strange country. She brings along a blanket that helps her feel safe. One day she encounters a girl in the park. The two become tentative friends even though they don’t share a language. When the girl starts to teach her new words she starts to create a new blanket from the new words. Lovely. If All the Animals Came Inside. This was one of New Kid’s favorites. A high-spirited, rhyming book which showcases the crazy things that would happen if, say, you let a porcupine sit in a chair. Out of the Woods: A True Story of an Unforgettable Event by Rebecca Bond is one of my personal favorites. 100 years ago, a boy lived with his mother in an Ontario hotel nestled between the woods and a lake. The young narrator describes his fascination with the bustling life of the guests and their different occupations. However, he wishes he could see more of the animals, which stay away because of the logging. One day there is a forest fire and miraculously the human and animal populations finally meet. What Do You Do With an Idea? I love the way this book teaches that having an idea is not always the same as being hit by a bolt of lighting. Ideas can start out small, and if you nurture them they will turn into something wonderful and maybe even change the world. An inspiring book for kids of all ages. Mr. Ferris and His Wheel. If your kids like non-fiction, this is a fascinating look at how an engineer defied gravity to create the iconic Ferris Wheel. The illustrations are simply fantastic and the text effectively combines a compelling and rather suspenseful narrative with historical facts about the invention. One Busy Day: A Story for Big Brothers and Sisters. Little sister Mia wants to play with her big brother, Spencer. Spencer claims he is too busy, but the two children become enmeshed in imaginative play and very, very busy together. What attracted my son to this book was the contrast between what was happening on the page and the words of the story. The text describes the grand adventure that is happening in the children’s imagination, but in the illustrations we see them joyfully playing with everyday items like cardboard boxes and kiddie pools. My 5 year old loved pointing out that contrast, which was an excellent exercise in reading comprehension! Big Red Lollipop. Rubina’s sisterly love is tested when her mother insists she take her little sister, Sana, to a birthday party. It’s stretched even farther when Sana eats her lollipop! Argh! Every kid can relate to that! The picture of sibling rivalry is handled deftly by author Rukhsana Kahn and the story also touches a bit on cultural differences (The author is Pakistani, and presumably so is the family, though it is not mentioned in the text). No Go Sleep! is great fun, but I can’t be help responsible if your child echos “No Go Sleep!” when you have finished reading. Every child can relate to and every parent will recognize the protagonist of this book who announces at each turn that he is not interested in going to sleep. Until, that is, he just does. The Mermaid and the Shoe is another tale I could add to our list of mermaid books. Little Minnow is one of King Neptune’s 50 daughters, but she is the only one who has yet to learn her talent. One day she finds a shoe and sets out to discover its purpose. Her journey introduces her to things she has never seen, and when she returns home to tell her story her father explains that her talent and purpose is to ask questions, explore and tell her stories. My 5 year old loved this book and I like the idea that while her sisters excel at activities the mermaid’s talent is using her mind to answer questions! The Princess and the Pig. This book features two strong girls, it’s just that one of them happens to be a pig. In a twist of fate a newborn princess changes places with a baby pig. The farmer and his wife are delighted and embrace raising their new daughter (after all, he thinks, this sort of thing happens all the time in fairy tales, right?) but the king and queen are convinced that it is the work of a witch and are convinced the cure is waiting right around the corner! This book is pleasantly and hilariously surprising, with bright, bold illustrations. It was a favorite with my sons. Lizard from the Park by Mark Pett. My son could not stop the “what if” questions after we read this book so fair warning! A boy finds an egg in the park, takes it home and when it hatches starts to care for his new pet doesn’t seem to stop growing. My son particularly liked the way the illustrations hinted at a future friendship for the boy and his unusual pet. When Dinosaurs Came with Everything. Well, I can tell you, if dinosaurs came with everything parents might not be so delighted, but it would be a child’s dream! However, as the mom discovers, having a bunch of dinos at home might turn out to be quite convenient after all. Swan: The Life and Dance of Anna Pavlova is an exquisitely illustrated book about the famed Russian ballerina. Anna grew up being told that her body was not right for ballet, but she persevered, believing that ballet was for everyone and brought beauty to the world with a new, dramatic and romantic style of dance. This is a marvelous story with a bit of heartbreak and is best for kids ages 5 and up. An end note gives more information on Anna’s life. The Mouse Mansion. 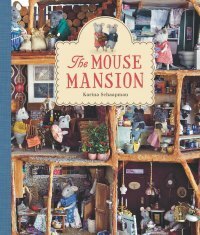 This a rather amazing book by a Dutch artist Karina Schaapman constructed an entire miniature world for apartment-dwelling mice. A little known fact about me is that I am obsessed with the miniature. This book contains 17 stories about the neighborly adventures of two mice, Julia and Sam. Julia lives with her mom in a small space, while Sam lives with his extended family. It is a lovely, fascinating book full of old-fashioned fun and simply marvelous photography of an intricate and tiny world. Quest is the much anticipated sequel to Journey. These wordless books have been enormous hits with my kids. I’ve written many times about how reading wordless books is beneficial and I was delighted to see my own advice paying off when I brought this book home from the library. My 5 year old immediately took to it, explaining the story of how two friends journey to a magical world to help a king escape his captors. Author/illustrator Aaron Becker’s thrilling imaginary tale will leave your family eager for the final installment. Find more wordless books here. Tiz and Ott’s Big Draw is brand new to the shelves this month and is a terrific addition to the “artists should have creative, messy fun” genre. Tiz the cat and Ott the donkey are enthusiastic artists who use their imaginations to encourage each other’s creativity. The text is minimal but with fun words to say, like “scumble” and “dollop” things stay interesting. Pair this book with a set of paints and you have the perfect gift. Beautiful Oops! is a good choice to inspire kids who are worried about their artwork being perfect and planned out. Here the non-perfect, the mistake, the accident is just the encouragement a young artist needs to create. The pop-up, lift-the-flap, interactive nature of the book gets kids thinking outside the box. Superhero School. Leonard is really looking forward to Superhero School: he’ll be leaping tall buildings, catching criminals and saving the world. What he doesn’t understand is why he has to learn about fractions and division. What a waste of time! Or is it? Hermelin the Detective Mouse is classic Mini Grey and is another great book for kids who like to “be in on the joke.” Hermelin watches a row of townhouses through a pair of mini binoculars. His skill with a typewriter allows him to write notes to the inhabitants and help them solve a series of minor mysteries. One day his note writing skills save a baby and the neighbors invite the mysterious Hermelin to a party. When they find out he is a mouse, they panic, but a friendly girl brings him back into the fold. There is so much to look at in the illustrations. Once you read this book the first time your kids will immediately want to comb back through the pages to find the clues that they missed. I love this kind of book for getting readers enthusiastic about the nuances of storytelling. Dear Mrs. LaRue: Letters from Obedience School, the second book about a dog who writes letters to his owner, Mrs. LaRue. When two cats go missing, Ike LaRue becomes the prime suspect. He escapes custody in order to prove his innocence and, of course, solves the case. While on the lam, Ike must visit several city locations. He prowls through parks, searches seedy alleys, explores fancy hotels and finally saves the day on an apartment fire escape. Kids will enjoy pointing out the difference between actual events and LaRue’s account of what happened. Every child is unique. Celebrate it! Niño Wrestles the World is great fun! My youngest son is really into all things “fighting” right now (much to my consternation!) and this Pura Belpré Award winner was a huge hit with him. Using his vivid imagination, Niño wrestles uses his stellar moves, like the “tickle tackle” and the “puzzle muzzle” to best alarming intergalactic opponents, but when it comes to his biggest challenge, “Las Hermanitas”, Niño pulls out his very special moves. Niño is imagining himself as a “Lucha Libre” wrestler. An endnote describes this type of theatrical wrestling popular in Spanish-speaking countries. Little Kunoichi, The Ninja Girl by Sanae Ishida is pure fun. Little Kunoichi, who lives on a super secret island for ninjas in training, is working hard on improving her ninja skills. She finds a kindred spirit when she makes friends with a samurai-in-training and the two practice their skills in the most imaginative ways. This is a marvelously good spirited book and I loved that there was a “Did You Know?” section at the end with more information about Japanese culture and ninjas. 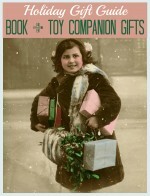 Click on the images below for more book gift ideas!